One wonders why Azharruddin gave permission to make this film—for even though it purports to remove the stigma of the match fixing scandal from him , it actually once again reminded me of the whole gory saga and the endless speculation about the whole thing in media about 16 years ago. And once again the movie brings back the days when Azhar was accused of match fixing and puts his infamy in focus. At the end of the whole movie some ingenious but ridiculous explanation is given as to why he took money from a bookie and how he was really a patriot after all blah blah blah….Does he really expect the public to be such a fool as to buy such explanations? One would have wanted him to not support the making of such a movie and let sleeping dogs sleep and not wake them up. Ravi Shastri and his family are sure to be angry at Shastri’s portrayal in the film- he is shown to be a womaniser who has to be saved by Azhar (who else!) from the scrutiny of his wife when he is philandering with women. It seems Azhar is taking revenge for the fact that Shastri was caught by Manoj Prabhakar on camera in a sting operation in 1999 saying that Azhar is being protected by Dawood Ibrahim, the Pakistan based don. Of course , Ravi was a well known womaniser, but what is shown in the film is too much. Kapil Dev also has escaped Azhar’s wrath because he came out in support of him later or so the film shows. Manoj Prabhakar obviously has not fared well. The film shows Azhar’s pain at not having been able to play 100 matches for India, something that he had promised his beloved grandfather whom he missed dearly after his death. Reason—the match fixing allegations, for which he was banned. Later half of the movie shows Azhar and his lawyer friend fighting a court case for years to get the ban lifted. It being a movie, there is ample scope for romance; both his first wife Naureen (Prachi Desai) and second wife Sangeeta Bijlani (Nargis Fakri) are shown. Prachi Desai acts well; Nargis is horrible. 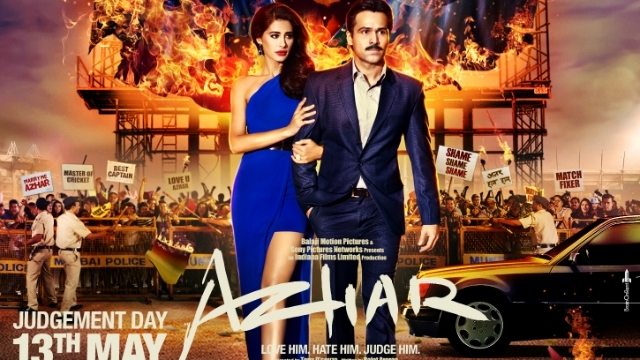 Azhar is plainly unapologetic about leaving his first wife for his second; the movie shows him openly declaring his affection for Sangeeta on live television without caring for the pain and hurt it would cause to Naureen. So does Azhar manage to get the ban lifted by court? And does he manage to get his named cleared in the eyes of the public by means of the film? Watch the movie to answer to the second question for yourself , for the answer to the first can be found by simple google search. The movie is clearly Azhar’s version of the story, for it leaves out his perfidies like his claiming that he was targeted for match fixing allegations because he belonged to the minority community. Eemraan Hashmi has tried his best to act like Azharuddin and has mastered his various mannerisms well. But he sounds too confident compared to the shy person he was supposed to portray. Music is decent and photography is okay. The film does not bore you and keeps you engaged throughout. But it focuses on the match fixing scandal and hardly shows the otherwise glorious cricketing exploits of it’s leading character.